Trout 3, Ebisu 1 . . . Streams that for whatever reason hold a sparse number of trout, perhaps two or three per mile, can make even a stocked trout fishery a challenge tenkara can handle. Handle of pine: the Ebisu this time out. The 12-foot rod’s more limber 5/5 flex allowed tighter casts within side channels the width of city sidewalks. Runs walled by spring green, everything from tenacious native saplings to the shallow-rooted immigrant Japanese Knotweed. The traditional tapered line with six feet of 6X tippet landed soft hackles and nymphs with stealth along promising seams. The pine handle gives the Ebisu the feel of a baseball bat tapering to a 1-weight graphite tipped with a matching fly line. The Philadelphia Phillies, hosting the New York Mets and Pittsburgh Pirates, in that order, brought me to Philadelphia for a few days. 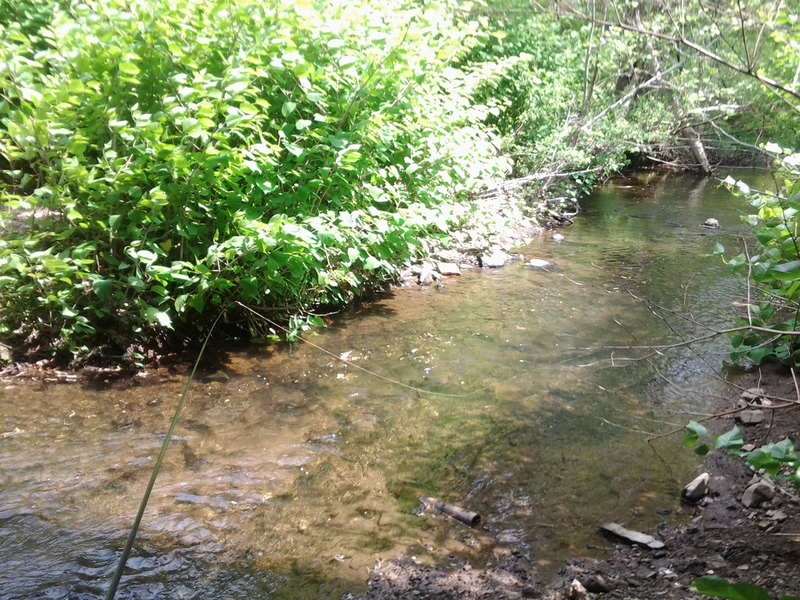 Valley Creek, French Creek, and Pickering Creek were nearby. The Wissahickon, The Schuylkill, and The Pennypack were within range. 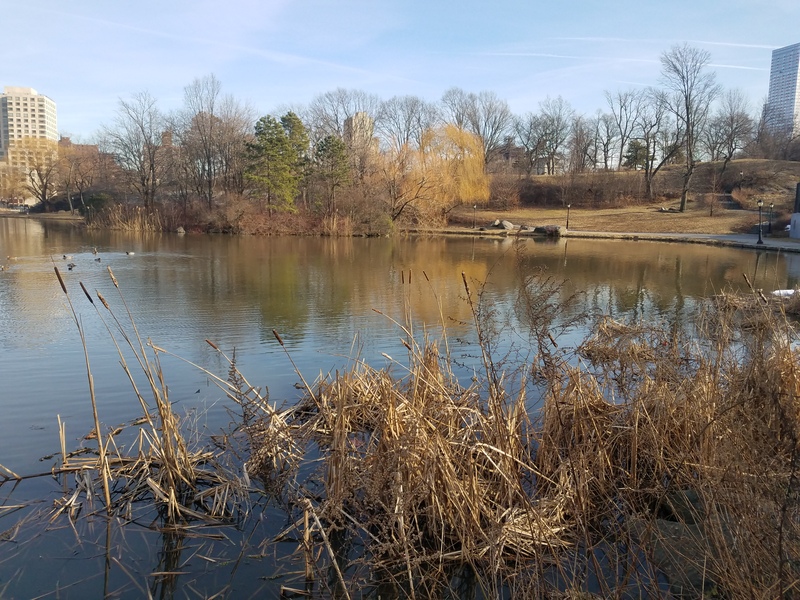 Waters borne on the pages of Philadelphia on the Fly and Small Fry: The Lure of the Little. What mattered more than destination this time was the full fishing experience with all of its supporting details. 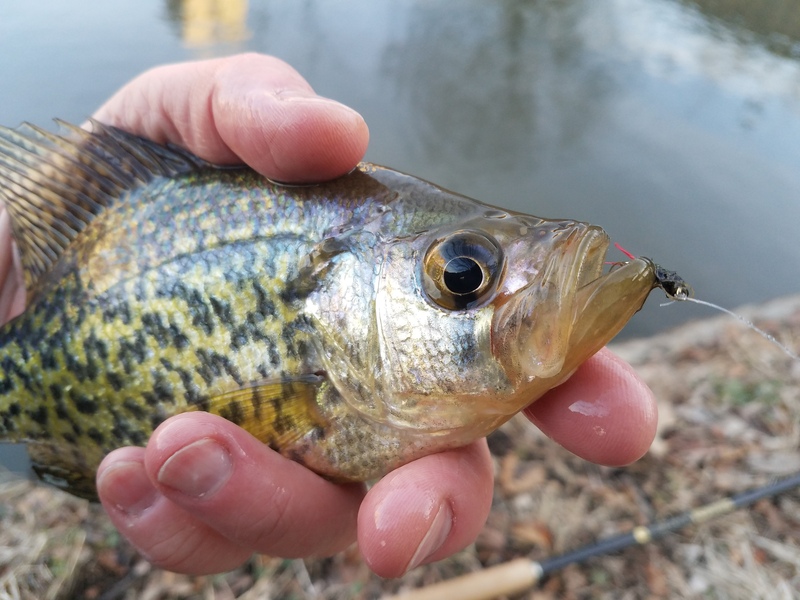 Spring fishing offers riparian zones flush with wildflowers and songbirds and streams, some marginal at other times of the year, now with trout, holdovers, survivors from the weeks following the opener. Reports of “little black stoneflies” were replaced by the actual witness to a few scattered rising Hendricksons approximated by a size 14. Forage of the moment took many, more meaty, forms: tiny black tadpoles, parent frogs, crayfish, and earthworms all were sighted in and along several streams. 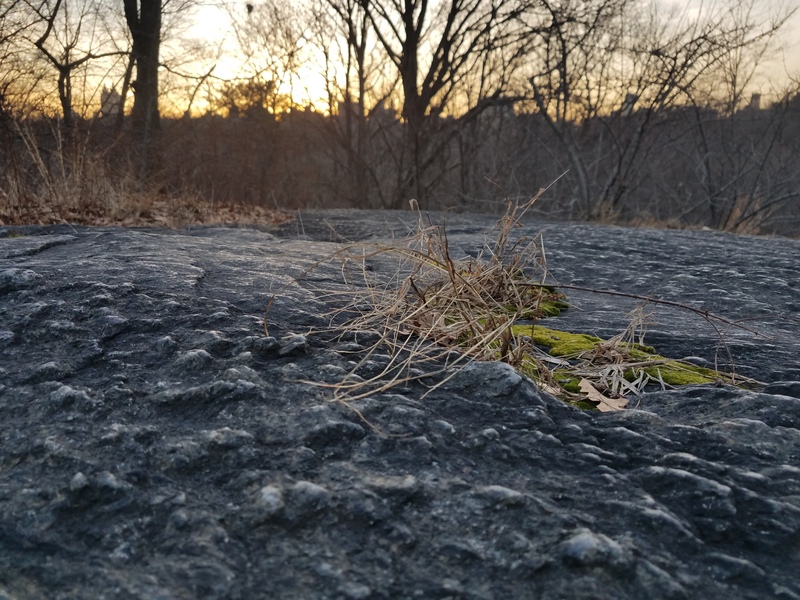 The flows were solid, clear, and warmer than expected given the long winter that had encased the Northeast in snow for three months. My India Hen and Herl and Silver Ribbed Deer Hair and Black soft hackles in size 12 fit just as well a hatchling tadpole. They were that small; the squiggling creature’s head and tail resembled a comma. 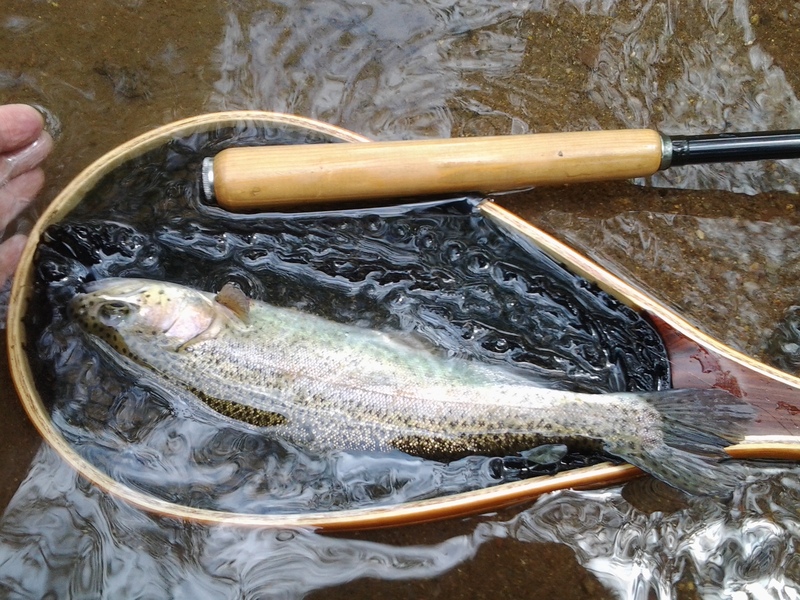 Trout, the simple fins to face direct encounter, were few. Again, these were scattered survivors of the opener. Natural forage was on their menu. Artificial colors and sweeteners had been by now learned to be avoided. Imitation, a general for the surveyed stream forage, called for some personal combination of thread, feather, perhaps fur and various glitter of some material, the blacker, the better. 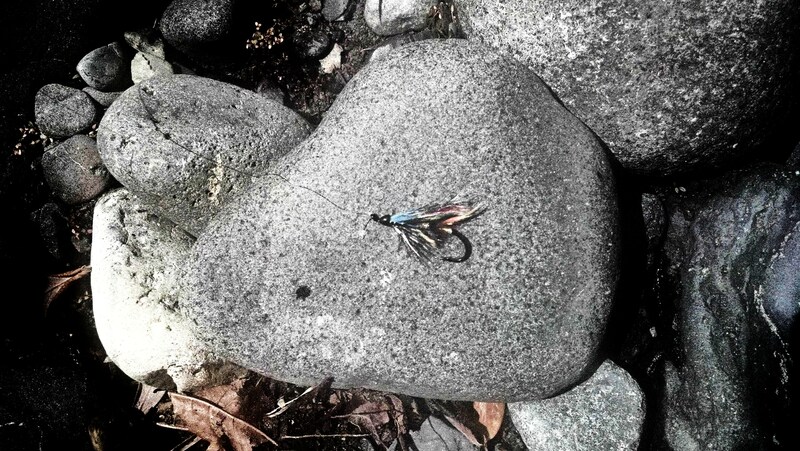 Tussles on the Ebisu were strong, yet static, a kind of slow motion take that saw trout drop the fly three out of four times along two wades of a mile and back. One rainbow in the net serves posterity enough. One rainbow a caudal fin short of a foot. The fish landed, and all the fish lost, were appreciated in light of the effort involved to lure their strikes. 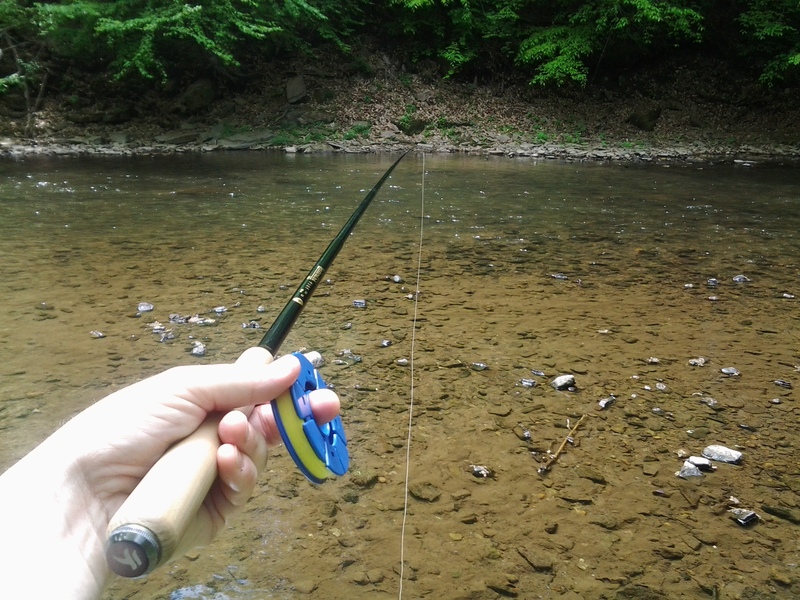 Insights on fly pattern awareness, as well as sightings of Baltimore orioles in full song and flight, wildflowers like the Mayapple, wild Mustards in abundance, plus a single Jack-in the-Pulpit, made a satisfying spring weekend of baseball and fly fishing that ended: Trout 3, Ebisu 1. The Luck of “The Spring” . . . I made myself meet the water a few days before this St. Patrick’s Day. I caught and released one fish. There was a sky full of helicopters, a loose chain of ambulances at emergency, and deep rumbling rolling in from the Northeast. Air, not natural, had burst from the seams and taken down a piece of Manhattan. My day off: fishing as this was occurring. 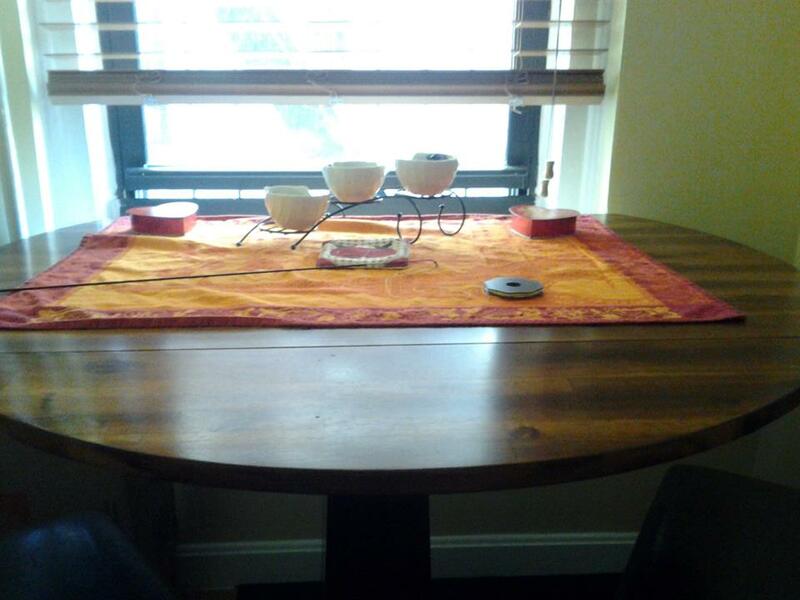 An awareness of balance, rather than a feel of guilt, charged my exploration of “The Spring” in Winter. 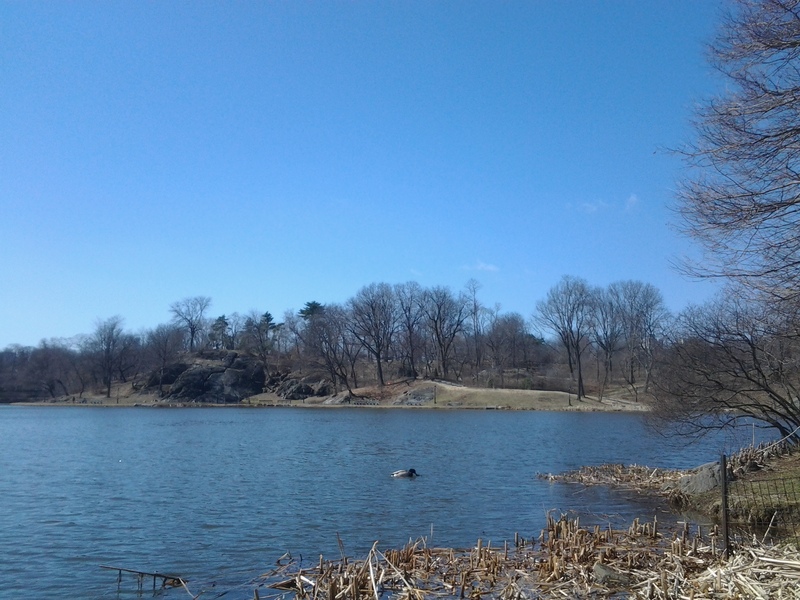 Harlem Meer, I would learn later, was a solid white floor surround by the yellow brown fields of March. Lucky Me: I chose first a greener ground of jade where “The Spring” offered water along one of three shorelines, most of the best spread out behind a bankside fence I chose lawfully not to cross. 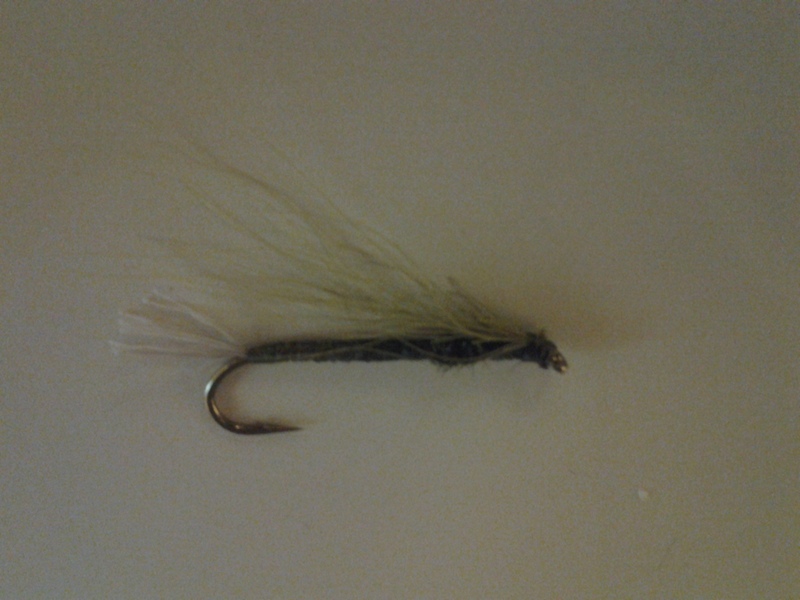 Hemmed within seventy-five feet of width, fifteen feet of breadth, and a depth measuring less than a rod’s length, I fished a Deer Hair, Peacock Herl, and Thread nymph of my own design. 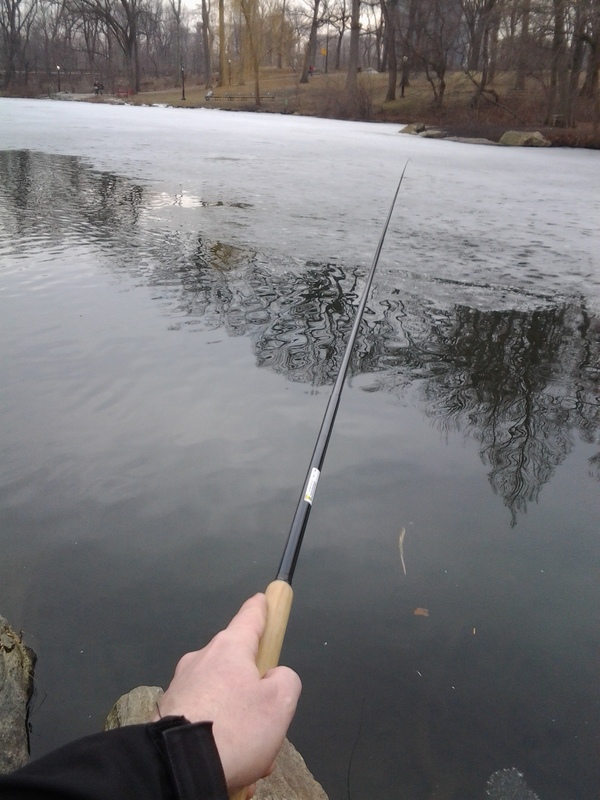 Plenty of cool casting onto the ice opened up to me on a 3.5 Level Line. 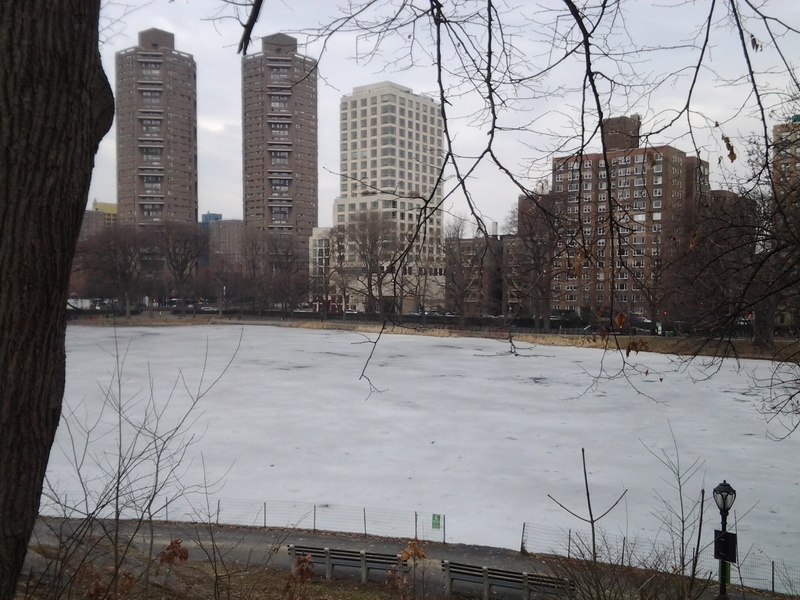 Thin ice is like an immense, monolithic lily pad. Audible slides along the ice with a tug off to the depths make for a great presentation when successful. 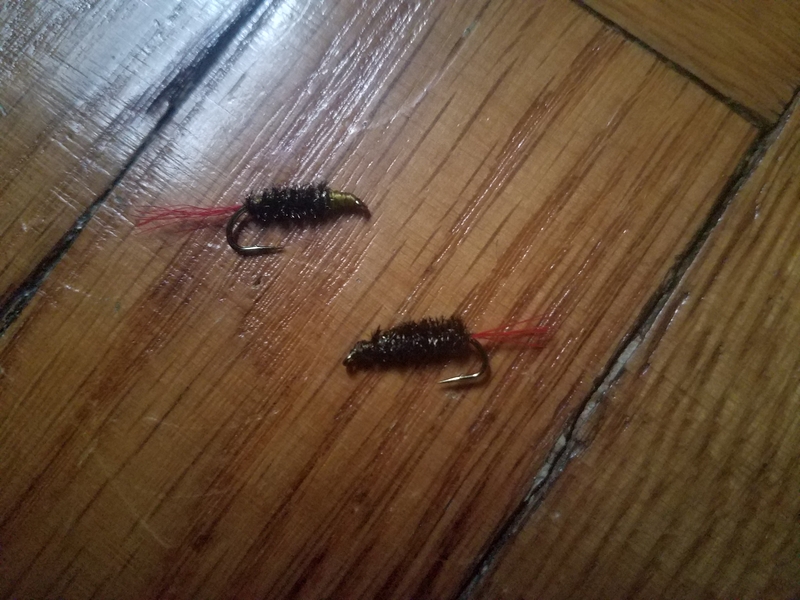 What works at an even higher level across the fishing spectrum is the same matched with a larger pattern: next an Olive Deer Hair and Floss Bucktail tied in a manner akin to a Mickey Finn, or with a sparse beard like my Green Guarantee, first described on The Global FlyFisher in 2008. Four extended periods of disaster noise sounded in the distance as I began to fish. The rumbles reminded my mind’s ear of the Baghdad air war thunder shown (and heard) on television during both Gulf War I and Gulf War II. The news through the fog of dust and information settled on eight dead, many injured and displaced. A gas leak? Investigation on site has not yet been engaged in full because of debris. There has been that much material mixed with potential survivors, so great care has been taken. On the top of the hour of one, a better blast sounded on my side. Luck struck. A sudden take a foot below the ice edge began to move. 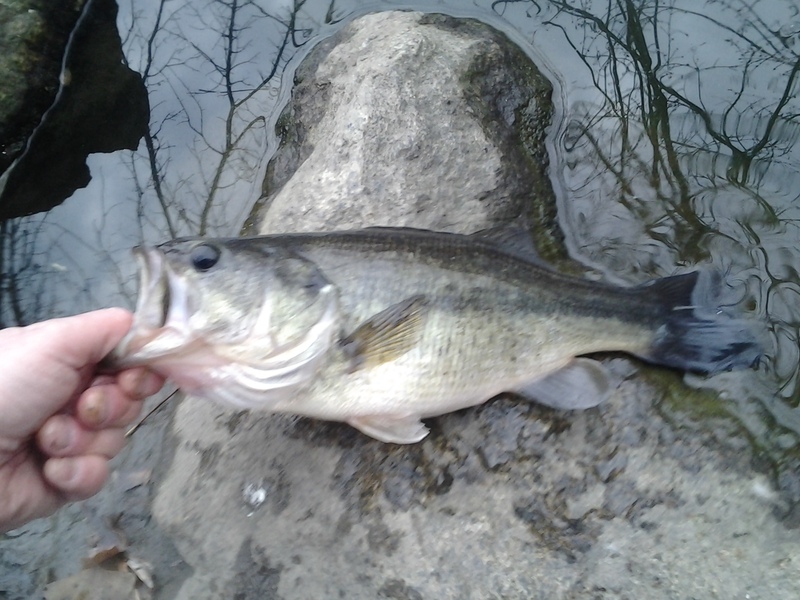 No winter sluggish fish was this; I saw twice in profile a thick bass with a purpose. The silhouette was a rounded female rather than a thin pickle of a male. I feared my tippet might fray as three runs under the ice audibly shaved my line against the blade on the water’s top. My Ebisu tenkara rod’s entire 5/5 flex was on arch display. I gripped the pine handle as if it were a solid body guitar. 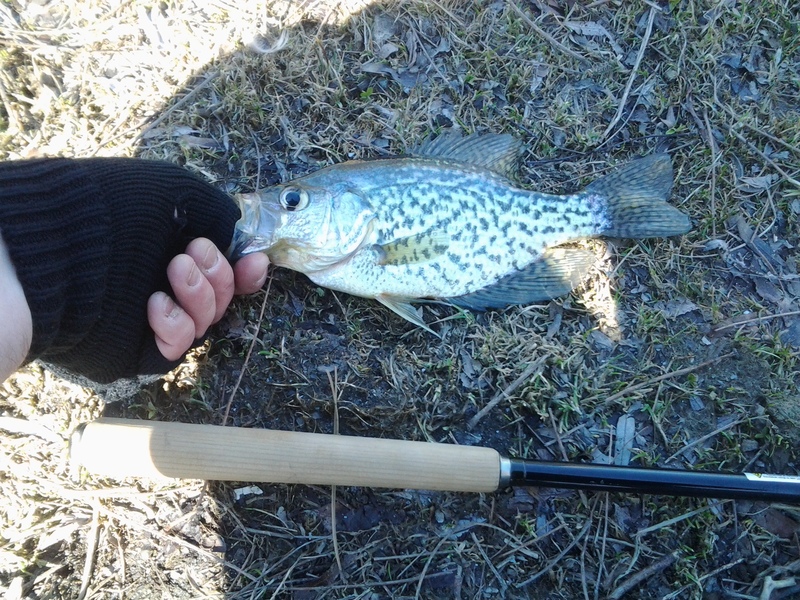 Grip locked in, I was able to lead the bass around a fallow pickerel weed garden to shore. I rarely lay fish on any surface for a photo except sometimes wet grass on rainy days. 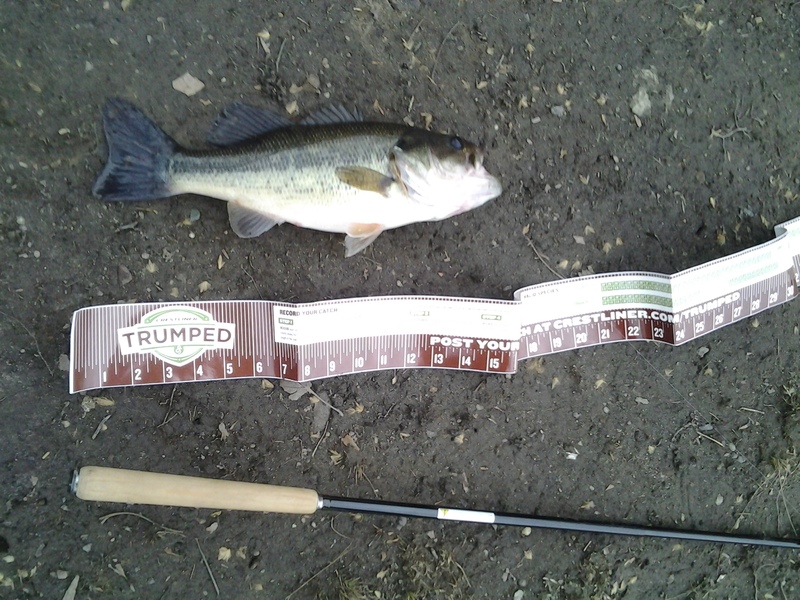 Skies overcast, air still, the fish remained calm and stretched as most largemouth bass will as it endured a bragging shot on packed damp soil beside my laminated ruler and Tenkara USA Ebisu. Best Honest Estimate: 15 inches, 2 plus pounds, female largemouth bass. The Luck of “The Spring” . . . an ironic reward, when still in winter. The depths of damp spring air. Bare branches and brick towers. Down into the wet water. Olympic Summer . 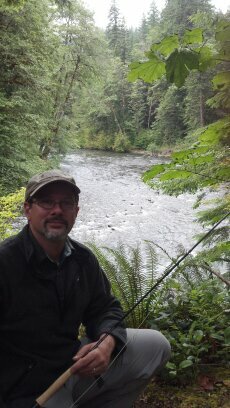 . .
My wife and I visited the Olympic Peninsula of Washington for the first time this summer. We planned to visit two good friends, Mara and Stephen, who had moved to the region from Arizona last year. 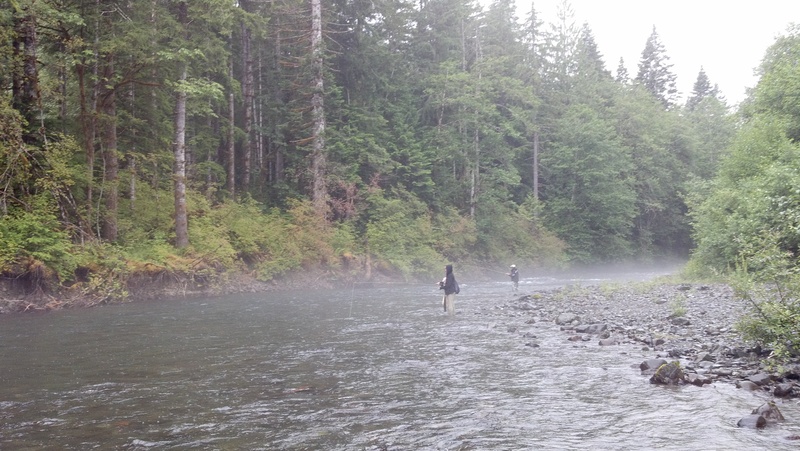 There was also the possibility we could explore the angling within this storied trout, salmon, and steelhead destination. When in an email our hosts made mention of the fact they had taken up the sport of fly fishing, I thought: What a happy coincidence! The first morning of our stay in Port Orchard, Washington, revealed we had landed in a new landscape. As we sat with new friends around the dining table of our bed and breakfast, the Cedar Cove Inn, I paused at one point during the meal to absorb a view I could never see in Manhattan. The snow-capped peaks of the Olympic Range emerged through a cool fog dissipating on a July morning. I excused myself and walked outside. The Cedar Cove has a lovely wraparound porch, and the building and grounds are situated on a point overlooking the town harbor and the gunmetal gray ships moored along the Naval Base Kitsap across the Sinclair Inlet. The weather felt like early October in New York, but the view was fully Pacific Northwest summer. The Kitsap Peninsula where Port Orchard is located resembles an arrowhead on the map. To the east is Puget Sound and Seattle. To the west lay the Hood Canal and Olympic Peninsula. The western slope draining into the Pacific is the land of the famous temperate rain forest and steelhead rivers such as the Hoh and Elwha. The eastern slope, which is somewhat drier, though just as forested, supports a number of other rivers that are better known for coastal cutthroat trout. Several of these, the Skokomish, Duckabush, Dosewallips, and Hamma Hamma, were within just an hour’s drive of our friend’s home beside the Sinclair Inlet. The Hamma Hamma name I had encountered before through my love of oysters. The Hama Hama oysters found on restaurant menus, (note the slight discrepancy in spelling), originate from the delta of this river. For that reason I suggested we explore the main run during the two days we had set aside for fly fishing. My Ebisu was ready to try this new and adventurous angling environment. 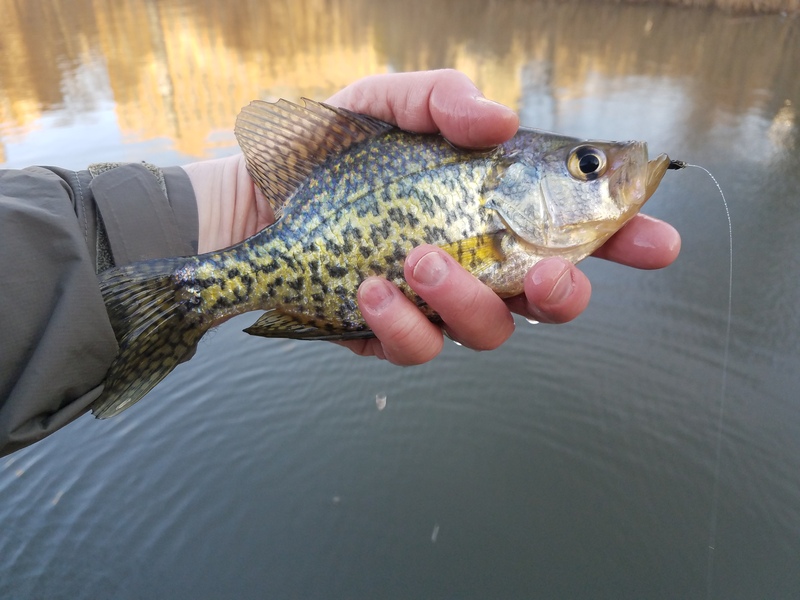 I had successfully fished with the rod both in Manhattan’s ponds and the Pennsylvania trout streams near my in-laws home in southeastern Pennsylvania. What I did do new is add to my fly box. I selected a few steelhead flies from the bins at The Urban Angler. I had prepared for the trip in part by reading The Color of Winter by Doug Rose, and this book with its color plates of classic steelhead patterns inspired me to select both the white and purple Bead Head Woolly Bugger, the Jock Scott, and the Rusty Rat. I knew that our chances of encountering a steelhead in July were slim, so I invested in smaller size 8 and 10 patterns to perhaps lure two species neither of us had ever encountered: the Dolly Varden and the coastal cutthroat trout. We drove to the Hamma Hamma River on an overcast Friday the 13th. We skirted the rim of the Hood Canal and passed through the Skokomish Indian Reservation. It took nearly all of my fishing excitement to prevent a detour into the parking area of the tiny log cabin casino there on the tribal land; a casino not much larger than a family restaurant, which, I’m sure, would have provided an interesting if not lucrative experience. I was feeling Lucky 13, and literary as well, knowing I was near Port Angeles and the legacy of Raymond Carver, one of my favorite fiction writers, who was also a passionate fisherman. Part of me wanted to pull out a notebook and just write all of this into something new right there, yet I knew fishing, and tenkara, would be the basis of the day’s real story. We eventually followed a logging road that snaked through thick forest. A small sign pulled us toward the parking area of a small wooded camping area adjacent to the Hamma Hamma. We hiked a narrow trail surrounded by a canopy containing an infinite variety of green punctuated by bright orange salmonberries and pale yellow banana slugs, some nearly a foot in length. The water’s steady call drew us easily to its banks. A thin row of alders separated a cobblestone bar from the river. The water was clear and cold, so cold that a mist hovered over the glacial melt. I could see the reason for the temperatures at work when I looked up and saw snow fields on the high slopes of the steep valley through which the Hamma Hamma runs. Distant thunder could be heard and a spattering of rain that had followed us on our drive came and went. I have rarely been so excited to fish. 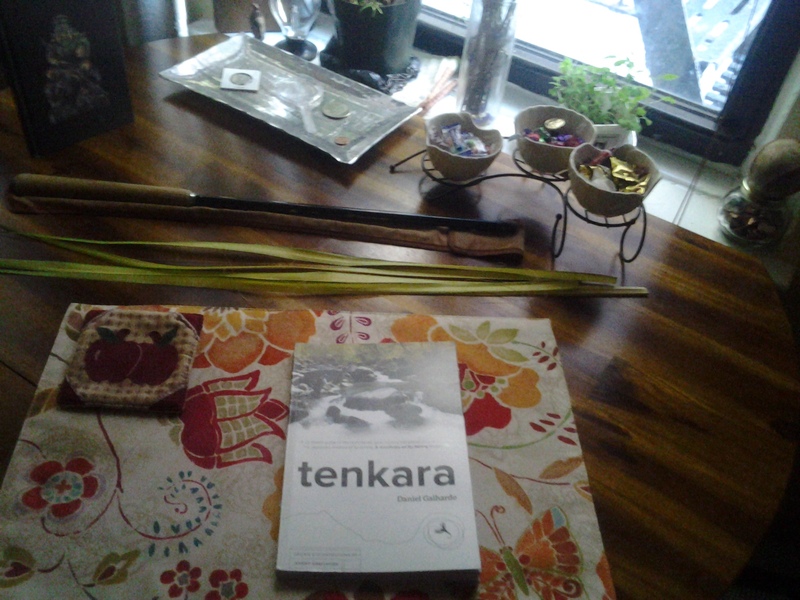 Tenkara made setting up so much easier despite the emotional distractions inherent in enthusiasm. The telescoping rod, the lillian, the level line, a slip knot, and a size 10 Rusty Rat were assembled, tethered, and tied in seconds rather than minutes. The gentleman in me handed the Ebisu to Maryann. I said I would rig up the 5-weight while she warmed up with the gentle casting action of the light tenkara rod. She asked if I was sure. Her smile and green eyes made a “Yes!” as easy as breathing. Of course the first tapered leader I removed from the convenient 3-pack recombined into a bird’s nest after I had looped it onto the end of my pale green floating fly line. 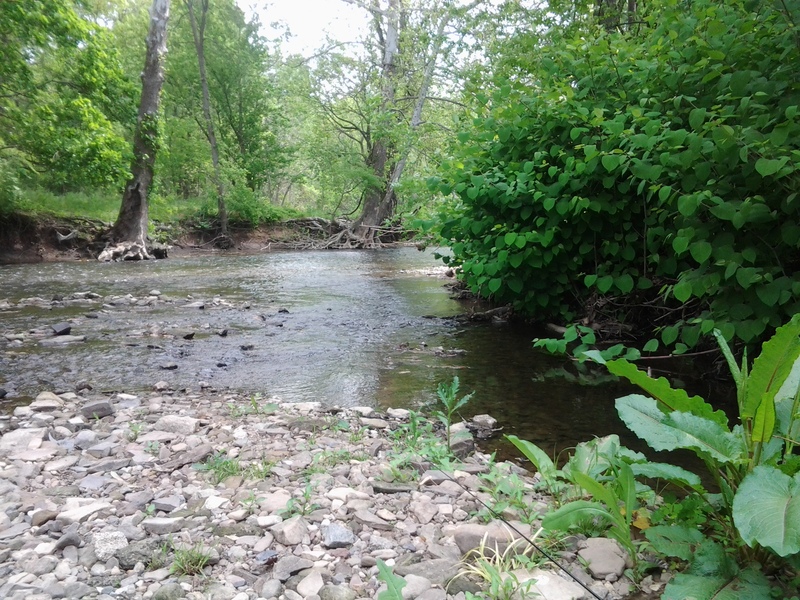 Maryann and Stephen were knee-high in the creek and casting when I turned to survey their progress. 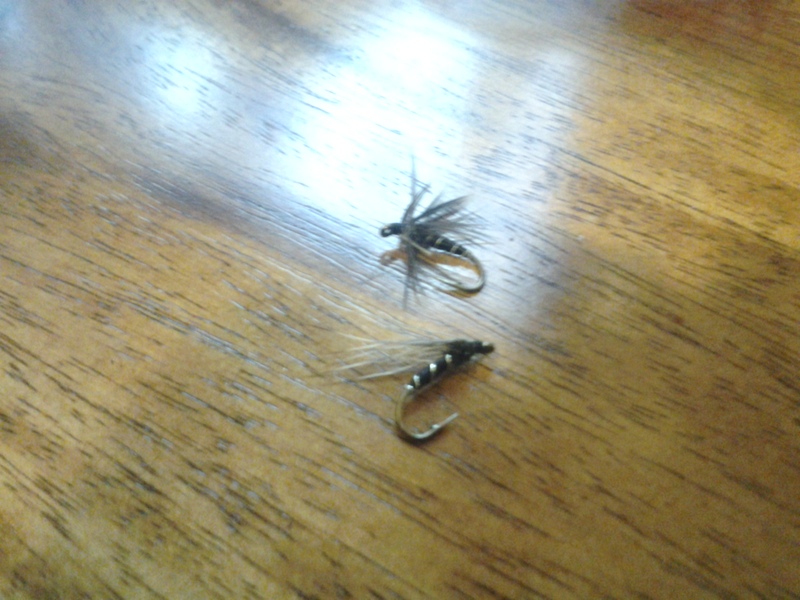 Both looked comfortably situated, throwing their patterns well upstream. There was a deep bend in the Ebisu, that’s for sure. I followed the line’s trajectory into the water with one swift look to the left. “No, you have a trout!” I exclaimed. Above the jade and milky quartz collage of the stream bed, resisting both the rod and the stiff conflicting currents of the cold Hamma Hamma, maneuvered a living band of silver and white. She brought the fish to her side and used her new net before my own boots had graced stream gravel. 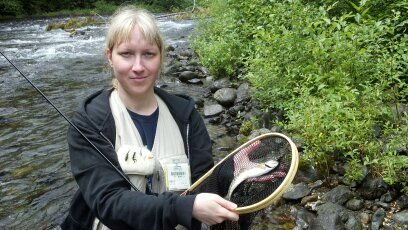 Held within the damp black mesh was a steelhead parr. The rosy band, leopard spots, and vertical namesake marks of this strong native were more vivid than any eastern brown trout or stocked rainbow I have ever seen, more pastel than the earth-toned brookie. We photographed the fish for posterity and then twisted the little steelhead fly from the top of its jaw. The fish slipped away and Maryann, smiling, breathing heavily with excitement, held out the tenkara rod to me. I shook my head. “Keep the line in the water.” And with that said I realized I had another kind of line. The ending that, as it so often happens, became another magical moment of conception.